National Home Fire Safety Week kicks off November 24 and runs through to November 30. It's likely no coincidence that National Home Fire Safety Week (November 24 to 30) takes place when the temperatures start to dip and we head into the winter season. After all, there's nothing better at this time of year than making a cup of hot cocoa, admiring your holiday decorations, and relaxing by the fire. But this perfect cold weather plan can easily be ruined if you don't take precautions to prevent a fire in your home. According to the Canadian Red Cross, a home fire is most likely to occur from December to March. Protect yourself and your home by being proactive this winter. Regularly test your smoke alarms and carbon monoxide detectors to ensure they're working properly, review (or create) a fire escape plan, and keep a fire extinguisher handy on each level your home. 'Tis the season for dinner parties which means it's time to serve up a healthy portion of fire safety before your guests arrive. Watch what you wear because loose clothing can easily catch fire when cooking. If you're hair is long, tie it back while working over the stove. Only pots and pans should be on your stovetop. Dish towels, cookbooks and paper towels should be kept well away from the burners. Stay in the kitchen while cooking. Unattended cooking is a leading cause of a cooking fire. Use timers to remind you when to turn off the oven or burners. Wait until after everything is cooked and the stove and oven turned off to enjoy your adult beverages. Deck the halls and your home with fire safety in mind. If you're buying a live tree for the holidays, make sure that it is fresh. A fresh tree's needles will not pull off easily from its branches or break when you bend them between your fingers. The tree's base, where it has been cut, should be sticky with resin. Give it the tap test too. When tapped on the ground, the tree should not lose many needles. Once you bring your tree home, water it daily to keep it moist. If you're buying an artificial tree, look for one that says it is fire resistant. Whether real or artificial, place your tree away from all heating elements, fireplaces and radiators. Check all electrical cords for damage before putting up your indoor and outdoor lights. If there is damage of any kind, discard the lights. Use extension cords sparingly and don't run them under a rug or behind a radiator or baseboard. Place candles on stable surfaces away from children or pets, as well as curtains, upholstery, or anything else that could burn. Do not leave lit candles unattended. 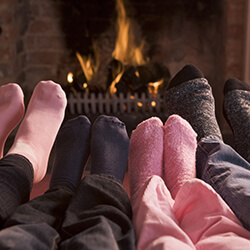 As warm and cozy as fireplaces are, they require regular maintenance and care to ensure they work safely. Clear the area around the fireplace to ensure a minimum one metre safety buffer. Open the damper before starting the fire and keep it open long after the fire has flickered out, until the ashes are cool enough to touch. Do not use flammable liquids to get your fire going. Never overload your fireplace. Use dry, well-aged, wood in small amounts to ensure a controlled fire. If using artificial logs, follow the instructions on the wrapper carefully and only burn one log at a time. Place a screen in front of the fireplace to prevent embers from escaping. An ounce of fire prevention today goes a long way in keeping you, your family, and your home safe this winter and holiday season. Should a fire break out however, despite your best efforts, you can take comfort in knowing you're financially protected for the damages caused with home insurance.